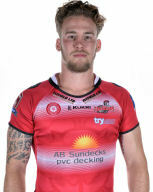 A talented, goalkicking halfback or fullback, Ben joined Leigh Centurions on a free-transfer from Castleford Tigers on a full-time contract in time for the start of preseason training in November 2014. He came to the fore in the 2014 season, making two Super League appearances for Castleford and impressing on a dual registration contract with Kingstone Press Championship One League Leaders York City Knights. Reynolds was joint Championship One Young Player of the Year in 2014 alongside City Knights team-mate James Saltonstall, was one of the nominations for Championship One Player of the Year won by York team-mate Jack Lee and also selected in the Championship One All Star team. He scored seven tries and kicked 67 goals in 16 appearances for York during the season. A former Knottingley and Featherstone Lions ARL product, Reynolds graduated through the ranks of the Castleford Tigers Academy and had been training full-time with the Tigers’ first-team squad since November 2012. Though his first-team opportunities for Leigh were limited in 2015 he made eight appearances, scoring three tries and kicking six goals, having spent a month loan at Doncaster early in the campaign. Ben signed a three-year contract extension tying him to the Club until the end of 2018 and was involved in a season long loan deal to Dewsbury Rams for the 2016 season to gain more first team experience, but was recalled by Head Coach Neil Jukes in March 2016 after the Club’s mounting injury list and reappeared for the Centurions in their fine victory at Halifax.